RC 190 Transfers SGT SA LP PET HM Manual Counselling Dates, AP Teachers Transfers Schedule Manual Counselling dates New Counselling Procedure Rc 190 dt.18.07.2017, AP Transfers step by step instructions for manual counseling and schedule from 21-07-2017 to 31-07-2017. 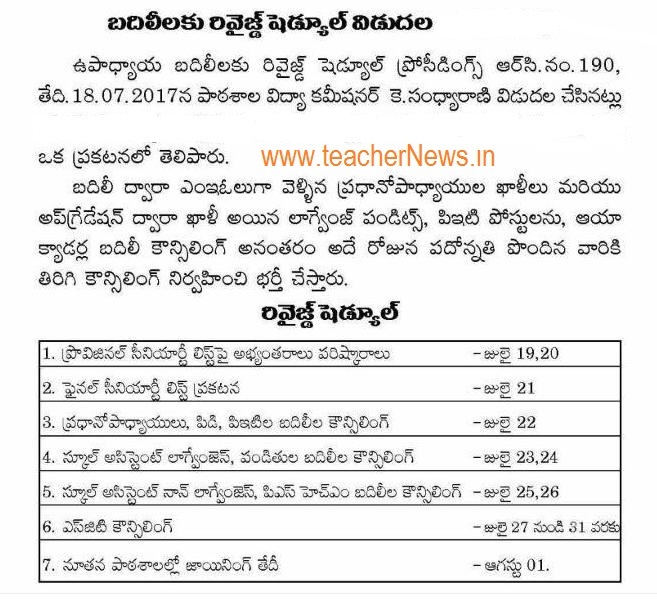 AP Teachers transfers revised Schedule, Online apply last date, web option new dates, School Education Issue of Rules, The Andhra Pradesh Teachers (Regulation of Transfer) Rules – Revised Time Schedule – Communication- Reg. The attention of all the Regional Joint Directors of School Education and the District Educational Officers in the state wherein time schedule for completion of Rationalization and Teachers Transfers was communicated to them for strict compliance. AP Teachers Transfers new schedule, AP teachers transfers 2017 GO, AP teachers transfers latest news, AP teachers transfers seniority list, AP teachers transfers online Application form, AP teachers transfers 2017, AP teachers transfers 2017 schedule and AP teachers transfers 2017 guidelines.